I don’t truss my chickens. I know that it breaks cardinal rules of roasting whole birds. Long ago, I learned to truss, and never saw a difference in cooking time, tenderness or flavor, so I stopped. Yes, I prepare my birds with lots of love, massaging them with salt and oil, letting them rest before and after roasting, rubbing them with piquant herbs and ample seasoning. But tying them into straight-laced submission stopped making sense. Now I roast in a whole different, flagrant method: First, I cut out the backbone, and the wings, which I freeze to make stock later. Then I place them spread eagle on a flat roasting rack on top of a baking sheet. The only way I can describe this method is by calling it “slutty.” I mean it in the fondest of ways, like the girl who didn’t always follow the norm in high school, but got everyone’s attention and definitely made us trussed up girls wish we were a bit bolder. I can guarantee that its immodest display exposes the bird’s skin in a way that makes it succulent, crisp and golden, a definite goal of the most popular girl in class. I use Meyer lemons in this recipe, but if they aren’t available, any other type of lemon is suitable. If fresh oregano is not available, use a good quality dried oregano and reduce it by half. The chicken cut is similar to a spatchcock method, without being pressed flat, search a YouTube tutorial online if you’d like more information. Chicken cut in this method roast more quickly than whole birds. In addition, taking the chicken out of the refrigerator for 15 minutes brings it closer to room temperature and lessens roasting time. 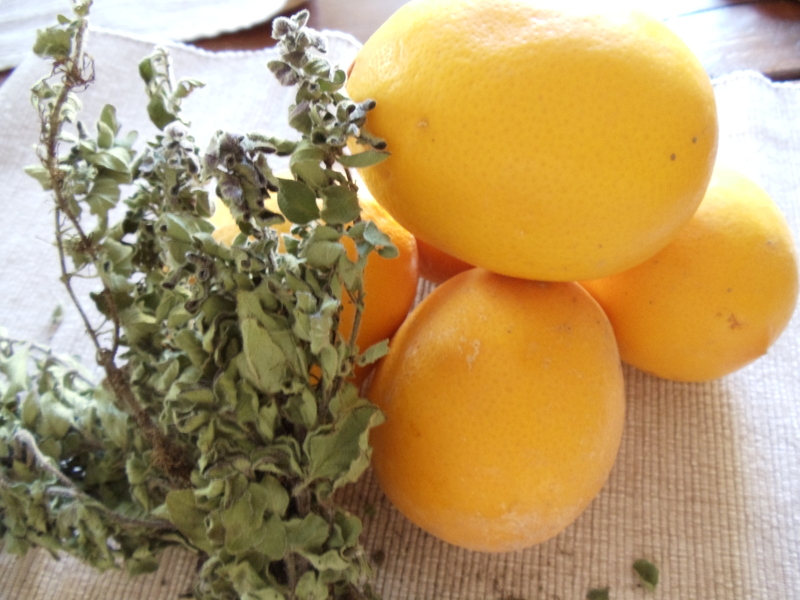 You can use any combination of herbs, such as rosemary, sage, or thyme, and any type of citrus zest, like orange or lime that you wish. Place chicken, breast side up, on a large cutting board (I prefer plastic so I can wash and sanitize it in the dishwasher.) Remove the wings by cutting at the joint, either with a kitchen shears or a sharp chef’s knife. Turn the chicken breast side down, then cut along the backbone, either with a pair of kitchen shears, starting at the thigh and working up toward the neck, or using a very sharp chef’s knife. Put the backbone and wings into a plastic freezer bag and freeze to make into stock at another time. Turn the chicken and cut the backbone out on the opposite side. Place the chicken breast side up on a flat cooking rack inserted into a roasting pan. 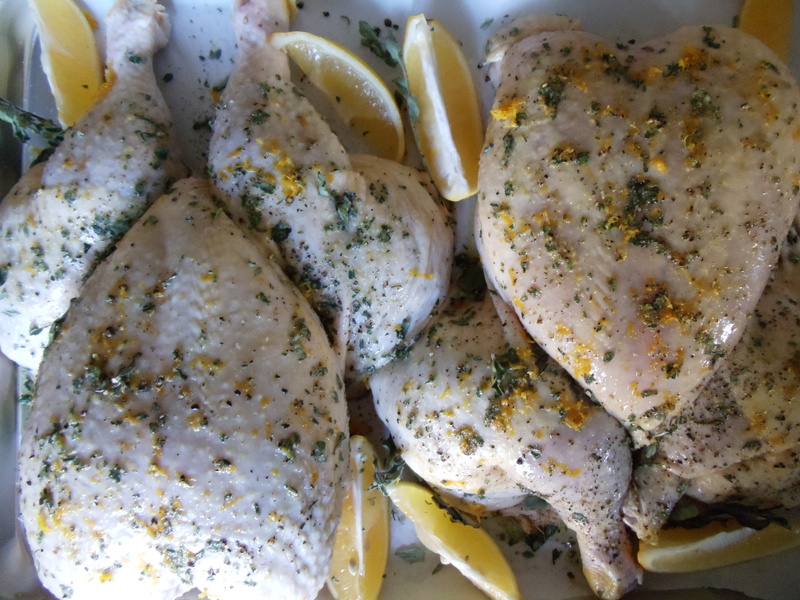 Drizzle with olive oil, and season generously with salt and pepper, over the skin and underneath the chicken. Allow chicken to come closer to room temperature, about 15 minutes. Meanwhile, heat oven to 375. Zest the skin of the Meyer lemon, mince the oregano, and distribute over the skin of the chicken, rubbing in to coat the breast, thighs and underside of chicken. Cut the zested lemon into wedges and distribute in the roasting pan. Once oven is heated and the chicken has warmed up a bit, place the chicken in the oven and roast for 75 minutes, or until the skin is brown, the juices between the thigh and breast run clear when pierced with a knife, and the thigh registers at 160 degrees with a probe thermometer. Remove the chicken from the oven and cover loosely with aluminum foil. Rest for 10 minutes, then slice to serve. Mouthwatering, YUM! Lemon with anything is always a success story to me. Love the recipes and especially the “close-up” pics. Thank you, Diane!